JOHNSTON, Iowa, — Pioneer® brand A-Series soybean growers set a new Pioneer record for 100 bu/A yields in 2018. The elusive 100-bushel yield ceiling was broken more than 50 times in on-farm trials across the United States. The previous record was set in 2016 when 15 Pioneer brand varieties broke the 100-bushel mark in on-farm plots. In nearly 5,000 on-farm comparisons in 2018, the top 40 Pioneer brand soybean varieties by volume showed a 2.6 bu/A average yield advantage over competitive varieties, winning 66 percent of the time. 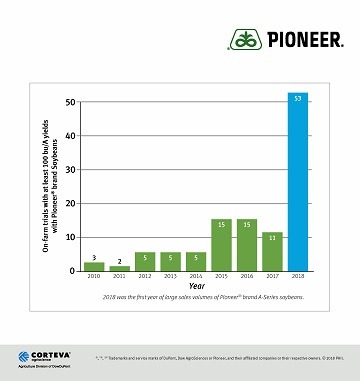 Pioneer’s A-Series breeding efforts are deployed across all of its soybean herbicide-tolerant trait platforms to deliver soybean growers top-performing varieties. Boasting a 1.8 bu/A yield advantage vs. competitive varieties with Roundup Ready 2 Xtend® (RR2X) technology, Pioneer brand A-Series soybeans with RR2X technology had 62 percent wins in more than 5,000 on-farm comparisons. Pioneer brand A-Series varieties with the LibertyLink® gene outyielded competitive LibertyLink varieties by 5.9 bu/A in 300 comparisons, winning 79 percent of the time. Corteva Agriscience™, Agriculture Division of DowDuPont (NYSE: DWDP), is intended to become an independent, publicly traded company when the previously announced spinoff is complete by June 2019. The division combines the strengths of DuPont Pioneer, DuPont Crop Protection and Dow AgroSciences. Corteva Agriscience™ provides growers around the world with the most complete portfolio in the industry — including some of the most recognized brands in agriculture: Pioneer®, Encirca®, the newly launched Brevant™ Seeds, as well as award-winning Crop Protection products — while bringing new products to market through our solid pipeline of active chemistry and technologies. More information can be found at www.corteva.com. Follow Corteva Agriscience™, Agriculture Division of DowDuPont, on Facebook, Instagram, LinkedIn, Twitter and YouTube. Pioneer® brand products are provided subject to the terms and conditions of purchase which are part of the labeling and purchase documents. ®, ™, SM Trademarks and service marks of DuPont, Pioneer or their respective owners. DO NOT APPLY DICAMBA HERBICIDE IN-CROP TO SOYBEANS WITH Roundup Ready 2 Xtend® technology unless you use a dicamba herbicide product that is specifically labeled for that use in the location where you intend to make the application. IT IS A VIOLATION OF FEDERAL AND STATE LAW TO MAKE AN IN-CROP APPLICATION OF ANY DICAMBA HERBICIDE PRODUCT ON SOYBEANS WITH Roundup Ready 2 Xtend® technology, OR ANY OTHER PESTICIDE APPLICATION, UNLESS THE PRODUCT LABELING SPECIFICALLY AUTHORIZES THE USE. Contact the U.S. EPA and your state pesticide regulatory agency with any questions about the approval status of dicamba herbicide products for in-crop use with soybeans with Roundup Ready 2 Xtend® technology. ALWAYS READ AND FOLLOW PESTICIDE LABEL DIRECTIONS. Soybeans with Roundup Ready 2 Xtend® technology contain genes that confer tolerance to glyphosate and dicamba. Glyphosate herbicides will kill crops that are not tolerant to glyphosate. Dicamba will kill crops that are not tolerant to dicamba. Roundup Ready 2 Xtend® is a registered trademark of Monsanto Technology LLC used under license. Liberty®, LibertyLink® and the Water Droplet Design are trademarks of Bayer. The unique LumiGEN™ system brings together a customizable and integrated combination of best-in-class seed applied technologies, genetic and trait packages, and leading digital agriculture technologies to place the right product on every acre to meet each customer’s needs. **Data is based on 638 head-to-head comparisons between DuPont™ Lumisena™ fungicide seed treatment (0.568 fl oz/cwt) and Metalaxyl (0.75 fl oz/cwt) in the top soybean-producing states through Dec. 12, 2017. Comparisons were made utilizing the same soybean variety. The foregoing is provided for informational use only. Please contact your Corteva Agriscience seed brand representative for information and suggestions specific to your operation. Product performance is variable and subject to any number of environmental, disease and pest pressures. Individual results may vary and from year to year. Product label instructions must be followed at all times. No offer for sale, sale or use of these products are permitted prior to issuance of the required country, region or state registrations.